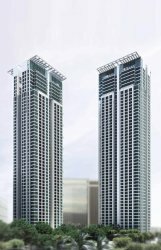 Roxas Triangle Towers is a Two Tower development piercing the skyline at the Heart of a Great City. Launched in 1996, its 1st Tower remains the city’s most esteemed premier residential community, maintaining among the Highest Occupancy and Lease Rates in Makati since its completion in 2001. Defining the highest standard for location, residents-only services, and design, Roxas Triangle Towers brings to light a Sublime Living Experience that is simply not available anywhere else. Roxas Triangle Towers rises on an 11,812 sqm property at the heart of the Makati Central Business District. Positioned at the corner of Paseo de Roxas and Cruzada Street, Roxas Triangle is one of the country’s most valuable locations hidden in plain sight. Auspicious in form and experience, Roxas Triangle and Ayala Triangle form a figure 8 symbolic of the infinite quality among Makati City’s most iconic communities. The Two Roxas Triangle units are also clear manifestations of its rarity. The entire 52-level tower only contains a total of 182 units. Its exclusivity is even raised by several notches as each floor only has 4 units in comparison with a typical high-end building that has about 10 to 12 units. Residences are spacious and uncompromised, staying faithful to the standards that define life in Roxas Triangle Towers. One Roxas Triangle has already surprised the community with its unrivaled brand of modern luxurious living -that comfort and exclusivity can never be compromised even when living in the city. And with the arrival of Two Roxas Triangle, the living experience is elevated to a rarefied state, one that is only available for the discerning few. Two Roxas Triangle concludes the Roxas Triangle Towers Development. A New Generation is welcomed to the Best of Contemporary Possibilities.